China’s foreign exchange reserves continue to surge. As of September, the total stood at $2.64 Trillion, an all-time high. However, it’s becoming abundantly clear that China is no longer content for Dollar-denominated assets to represent the cornerstone of its reserves. Instead, it has embarked on a campaign to further diversify its reserves, with important implications for the currency markets. Despite China’s allowing the Chinese Yuan to appreciate (or perhaps because of it), hot money continues to flow in – nearly $200 Billion in the the third quarter alone. Foreign investors are taking advantage of strong investment prospects, rising interest rates, and the guarantee of a more valuable currency. In order to prevent the inflows from creating inflation and putting even more upward pressure on the RMB, the Central Bank “sterilizes” the inflows by purchasing an offsetting quantity of US Dollars and other foreign currency. Since the Central Bank does not release precise data on the breakdown of its reserves, analysts can only guess. Estimates range from the world average of 62% to as high as 75%. At least $850 Billion (this is the official tally; due to covert buying through offshore accounts, the actual total is probably higher) of its reserves are held in US Treasury securities. It also controls a $300 Billion Investment Fund, which has made very public investments in natural resource companies around the world. The allocation of the other $1.5 Trillion is a matter of speculation. Still, China has stated transparently that it wants to diversify its reserves into emerging market currencies, following the global shift among private investors. Investment advisers praise China for its shrewdness, in this regard: “The Chinese authorities are some of the smartest in the world. If you look at the fundamentals of a lot of these emerging markets, they are considerably better than developed markets. Who wants to be holding U.S. dollars at this stage?” However, these investments serve two other very important objectives. The first is diplomatic/political. When China recently signed an agreement with Turkey to conduct bilateral trade in Yuan and Lira (following similar deals with Brazil and Russia), it was interpreted as an intention snub to the US, since trade is currently conducted in US Dollars. In addition, by funding projects in other emerging markets through a combination of loans investments, China is able to curry favor with host countries, as well as to help its own economy at the same time. The second is financial: by buying the currencies of trade rivals, China is able to make sure that its own currency remains undervalued. This year, it has already purchased more than $5 Billion in South Korean bonds, and perhaps $20 Billion in Japanese sovereign debt, sending the Won and the Yen skywards in the process. For now, China remains deeply dependent on the US Dollar, and is still very vulnerable to a sudden depreciation it its value. For as much as it wants to diversify, the supply of Dollars and the liquidity with which they can be traded means that it will continue to hold the bulk of its reserves in Dollar-denominated assets. In addition, the Central Bank has no choice but to continue buying Dollars for as long as the RMB remains pegged to it. At some point in the distant future, the Yuan will probably float freely, and China won’t have to bother accumulating foreign exchange reserves, but that day is still far away. For as long as the peg remains in place, the Dollar’s status as global reserve currency is safe. Why is the Japanese Yen Still Rising? Most of today’s headlines regarding the Japanese Yen focus on one thing: Central Bank intervention. Basically, reporters have become focused on the likelihood of additional intervention in the currency markets by the Bank of Japan. 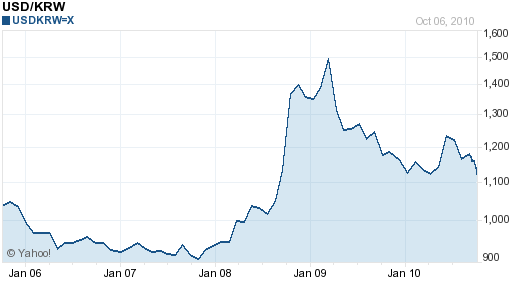 However, this obsession has caused them to overlook the larger issue: Why is the Yen still rising? I was prompted to ask this question after coming across the above chart, which tracks the historical performance of the Japanese Yen against the US Dollar. 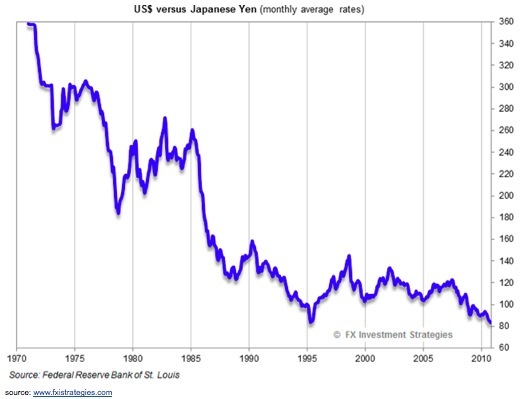 You can see that since 1970, the Yen has risen by a whopping 350% against the Dollar. It has doubled in value since 1990 and risen 14% since the start of the year, en route to a 15-year high. Over the same period (actually since 1980; I couldn’t find data from the 1970), Japan’s economy has expanded by an average annualized growth rate of 2.2%. Over the last 10 years, the average is a paltry .9%. The contradiction between fundamentals and reality could not be more stark! In addition, investor risk appetite has been reinvigorated. During most of the last decade, carry trading caused the Yen to decline to 120 USD/JPY as investors borrowed Yen in bulk in order to purchase high-yielding assets. The credit crisis spurred a short squeeze (i.e. 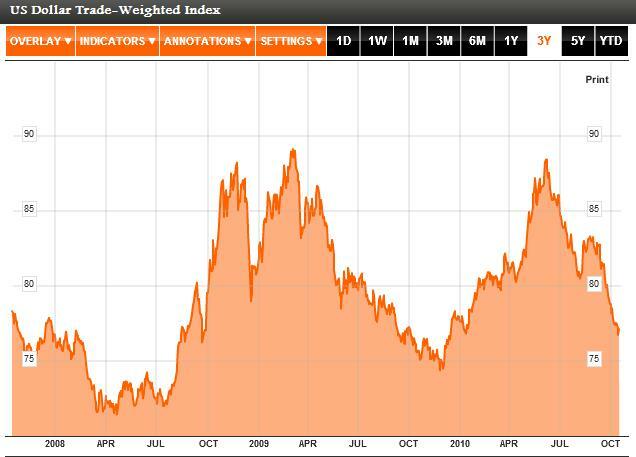 rapid unwinding of carry trade positions) in early 2007, and caused the Yen to rocket upward. If anything, we would expect the Yen to mirror its performance of a few years ago, as investors take advantage of low Japanese interest rates and rebuild carry trade positions in the Yen. The recent run-up in emerging market currencies, global equities, commodities, and other risky assets would certainly seem to support a carry trade strategy. For its part, the Bank of Japan is also doing its best to create a healthy environment for carry trading by printing currency, easing monetary policy, and fighting to keep the Yen from rising. And yet, if indeed there are still carry traders (and there certainly are! ), the current trend in forex markets suggests that they are very much outnumbered by those betting on the Yen’s rise. It’s difficult to understand this phenomenon. Those that hold Yen earn a nominal return of near 0%. Long-term interest rates (proxied by 10-year government bonds) are only slightly higher – at 1% – and certainly too low to attract any foreign institutional interest. Besides, it’s well-known that 90% of Japanese government debt is held by domestic savers. Meanwhile, the Japanese stock market has stagnated for more than 2 decades, and the Nikkei average is lower than at any point since 1985 (except for a brief period following the dot-com bust. Japanese real estate is equally unattractive. As a result, there are only two conceivable reasons for the Yen’s continued upward push. The first is fundamental/structural and is connected to Japan’s trade surplus. In spite of an appreciating currency, the Japanese export sector continues to be the lone bright spot in an economy with otherwise limited sources of growth. Compared to 2009, the trade surplus is up 83%, helped by a rise of 50% in September. It is on pace to top $100 Billion for the year. In this regard, foreigners that buy Japanese Yen do so because they must- for purposes of trade. The second source of demand for Japanese Yen is so-called safe haven flows. While the Japanese Yen is not a high-yielding currency, it is actually an excellent store of value. [This is one of the three primary functions that a currency should fulfill. The other two are medium of exchange and unit of account]. That’s because inflation in Japan is the lowest in the world, often to the point of being nil. Since 1970, the inflation rate has averaged only 3%, compared to 4.5% in the US. Over the last 15 years, inflation has been 0%. In other words, even if they are invested in low-yielding savings accounts, Japanese savers can ensure that 1 Yen today will probably still be worth 1 Yen 5 years from now. Foreign investors can take advantage of the same phenomenon, when they bet that the exchange value of the Yen will be equally stable. On the one hand, it is somewhat surprising that the Yen has been able to thrive in the current “risk-on” investing climate. On the other hand, there is a parallel thread of risk-aversion that will always exist and gravitate towards safe-haven currencies, such as the Yen. In fact, it can be argued that this contingent of investors is as large as the risk-taking contingent, as evidenced by the inexorable appreciation of gold (if not also by the Yen). Insofar as inflation in Japan remains nil and the Japanese export sector proves it can be competitive regardless of exchange rates, demand for Yen will continue to confound the gloomy forecasts and rebuff the best efforts of the Bank of Japan. In addressing the financial/credit/economic crisis, governments around the world have lowered interest rates, bailed-out bankrupt financial insititutions, engaged in wholesale money printing, guaranteed debt, and pumped cash into their economies. However, while such programs may have had some mitigating impact on the crisis, they did little to address the underlying cause. Specifically, debt was merely moved from one institution – one balance sheet – to another. Most of the bad debt that was at the heart of the credit crisis is still outstanding; the only thing that has changed is who is responsible for repaying it. In many cases, it is governments which have assumed ownership of this debt. Fannie Mae and Freddie Mac remain in a US government conservatorship. The Federal Reserve Bank owns more than $2 Trillion in US Treasuries and Mortgage Backed Securities. The European Union has agreed to collectively back more than $500 Billion in debt belonging to Greece and other unspecified “troubled” member states. The Japanese government has managed to pass off 90% of its sovereign debt onto its own citizens. The UK Treasury has printed money and lent it to the government of the UK. [The graphic below is actually interactive, and is worth a few minutes of perusing]. The only alternative then is to reduce the real amount of debt through monetary inflation or currency depreciation. In the US, inflation is at a 50-year low. In Japan, it is non-existent. In the UK and the EU, prices are hardly growing. Monetary policymakers around the world are now actively trying to spur inflation (for reasons unrelated to the reduction of debt), but to no avail. Interest rates are already at rock bottom, and Central Banks have injected Billions of newly minted money into circulation without any impact on prices. Currency devaluation is already taking place, but the main participants are emerging market economies (which are incidentally more concerned about export competitiveness than reducing the size of the debts). The Japanese Yen is nearing an all-time high, while the Euro has recovered from its spring lows. The British Pound is near its long-term average, while the US Dollar has declined only slightly on a trade-weighted average. In the end, since all of these countries are characterized by high levels of debt, it would be impossible for all of them to devalue their currencies. In addition, the nature of the Euro currency union precludes Eurozone countries from being able to lower their debts through currency devaluation. The story is the same for private debt. For example, most of the real estate (commercial and residential) debt associated with the collapse of the housing market has yet to be written off. Financial institutions and investors continue to hold onto it with the hope that the real estate market will soon recover, such that the losses will never need to be recognized. While this strategy could vindicate lenders/investors over the long-term, it continues to have a devastating effect in the short-term since it forces the holders of debt to keep more cash on their balance sheets, where it won’t find its way into the global economy. What are the implications for forex markets? Namely, it would seem to support the notion that emerging market currencies will continue to outperform the G4 currencies over the long-term. Over the near-term, it’s possible that G4 currencies will experience some appreciation, due both to the ebb and flow of risk appetite and the interventions of emerging market Central Banks on behalf of their currencies. Over the long-term, however, the only realistic alternative to default is currency devaluation, and at some point, the forex markets will have to come to terms with the fact that the G4 currencies need to decline. 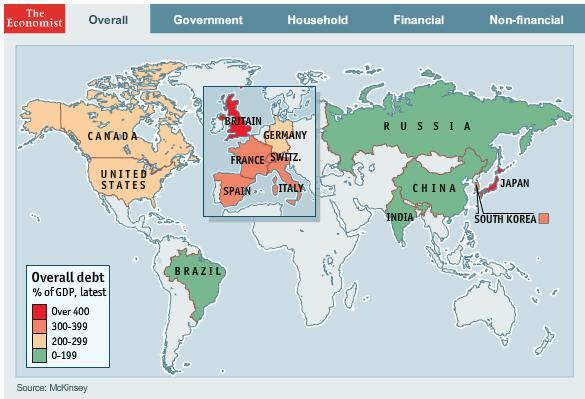 [Chart above courtesy of The Economist]. Have you ever heard currency cheerleaders rave about how unique forex is because there is never a bear market? Since all currencies trade relative to each other (when one falls, another must necessarily rise), it couldn’t be possible for the entire market to drop at once, as happens with other financial markets. The ongoing currency war might be turning this logic on its head, as currencies embark on a collective downward spiral. Profiting in this kind of market might involve exiting it altogether, and turning to Gold. For those of you who haven’t been following this story, a handful of the world’s largest Central Banks are now battling with each to see who can devalue their currency the fastest. [Of course, this war is being couched in euphemistic terms, but make no mistake: it is indeed a form of battle]. The principal participants are emerging market economies, which worry about the impact of rising currencies on their export sectors. However, industrialized countries have also intervened directly (namely Japan) and indirectly (US, UK). Among the major currencies, there are only a few that continue to sit on the side-lines, including the Euro (to a certain extent), Canadian Dollar, and Australian Dollar. For as long as the currency war continues, these currencies and the handful of emerging market currencies that have forsworn intervention will be the winners (at least from the point of view of speculators that deliberately bet on them). Then there are those that believe all currencies will suffer, and that even the currencies that are still rising are actually depreciating in real terms (due to inflation). Those who harbor such beliefs will often try to short the entire currency market, usually by betting on commodities or heavy metals, of which Gold is probably the most prominent. The price of Gold has risen more than 20% this year (in USD terms). Its backers claim that it is the ultimate store of value (where this derives from is unclear), and defend its lack of utility and inability to accrue interest by arguing that its appreciation is more than enough of a reason to own it. 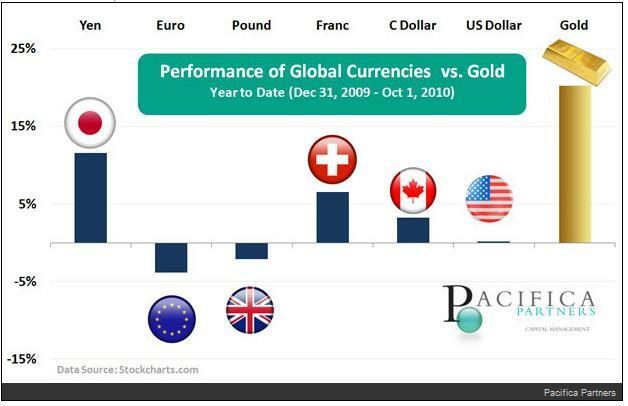 When you look at the performance of gold over the last five years, you begin to wonder if maybe they have a point. Interest in Gold as an investment has surged in the last couple years (and especially the last few months), as the currency wars have heated up and the Federal Reserve Bank contemplates an expansion of its Quantitative Easing program (dubbed” QE2″). On the one hand, the notion that the only way to defend against real currency devaluation is to own “alternative” currencies is well-founded. On the other hand, regardless of the fact that the Fed has already minted $2 Trillion in cash and that the US national debt is expanding by $1 Trillion per year, inflation in the US is low. In fact, it’s at a 50-year low, and at an annualized .9%, it’s practically non-existent. You would think that with Gold’s unending appreciation, we would be in the midst of hyperinflation, but that’s simply not the case. In the short-term, then, there’s really not a strong fundamental basis for investing in gold. That’s not to say that it won’t continue to appreciate and that investors will continue to buy into it merely to benefit from what has become self-fulfilling appreciation. From where I’m sitting, though, there’s really no foundation for this appreciation. Consider, for example, that gold investors still have to convert their gold back into paper currency in order for it to to be “used;” otherwise, it offers no benefit to the owner except that it looks pretty (though most investors wouldn’t know, since they buy gold indirectly). Not to mention that if/when the Dollar stops depreciating, there really isn’t really a justification to buy gold as a short-term store of value. Over the long-term, the picture is certainly more nuanced. I’m not going to explore the viability of fiat currencies here, but suffice it to say that, “Positioning for significantly higher gold prices over the long run demands a very bold strategic bet: that the global monetary system as we know it will completely break down and be replaced with a gold standard.” Regardless of the merits of this point of view, those that invest in Gold should at least understand that this is really the only justifiable reason to hold it. Those who are buying it because of the ongoing currency war will be disappointed. 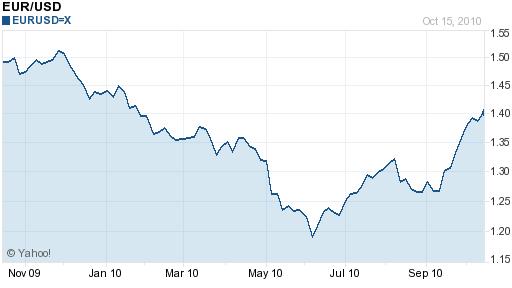 Since touching a four-year low in June, the Euro has risen a whopping 19% against the Dollar – a veritable surge! One has to wonder, however, if perhaps the Euro hasn’t gotten ahead of itself in its race back upward. The Euro’s nonstop rise has perplexed me. During the throes of the Eurozone Sovereign debt crisis, it seemed as if the Euro was headed back towards parity, if it even remained in existence! The European Commission’s $500 Billion bailout plan seemed to assuage the markets, but didn’t do much to mitigate against the risk of sovereign default. Besides, it looks like all of the austerity measures will be undone after the next election cycle. Opposition to further budgets is so vehement, and unemployment is so high (12% in Greece, 20% in Spain) that it will be difficult for leaders to stay in office if they continue to push an agenda that reduces their deficits. As evidence that bond investors remain skeptical, consider that Greek debt still trades at a 700 basis point premium to German bonds. EU cheerleaders love to point to the fact that at-risk Eurozone countries are having no trouble tapping the credit markets, but that’s not really surprising when you consider the lofty returns that investors receive for buying bonds that are essentially backed by the good credit of the EU. Even ignoring the fiscal problems of the EU, the economic picture is not pretty. “The Economist Intelligence Unit, in its just-released report…is forecasting that growth in Western Europe will reach only 1.1% next year, and at or below 1.7% at least through 2015, beyond which it wisely declines to look.” When you subtract out Germany – the engine of the EU economy – GDP growth will be even more pathetic. And don’t even mention the peripheral economies, many of which are at serious risk for sliding back into recession. On the other hand, the ECB is sterilizing all of its market intervention, which means that most of the funds that it is injected into the economy will remain in the EU. Contrast this with the Fed’s quantitative easing program (which hasn’t been sterilized) and you begin to understand why the Euro has held up well. In addition, Eurozone inflation currently exceeds US inflation (at a 50-year low), which means that the ECB will hesitate before following the Fed in easing monetary policy further. Still, I don’t think there is a strong foundation for the Euro’s rise. It’s understandable that the expansion of the Fed’s quantitative easing program (“QE2”) is making investors nervous, causing them to send cash out of the US as a preventative measure. However, this seems a little too much like the tail wagging the dog, since until QE2 is officially implemented, all anticipatory shifts in capital flows are purely speculative – not fundamental. And as a fundamental analyst, that concerns me. I think investors got ahead of themselves when they pushed the Euro down 20% over the first half of 2010, but now they are in danger of making the same mistake, and are pushing the Euro too far in the opposite direction. According to the most recent Commitment of Traders report, investors are building up long positions in the Euro, to the point that trading is becoming lopsided. I’m not much for short-term technical analysis, but when the Relative Strength Index (RSI) and Moving Average Convergence Divergence (MACD) are both approaching 2-year highs, it tells me that a correction is coming. In a few weeks, the US could overtake China as the world’s biggest currency manipulator. Don’t get me wrong: I’m not predicting that the US will officially enter the global currency war. However, I think that the expansion of the Federal Reserve Bank’s quantitative easing program (dubbed QE2 by investors) will exert the same negative impact on the Dollar as if the US had followed China and intervened directly in the forex markets. For the last month or so, markets have been bracing for QE2. At this point it is seen as a near certainty, with a Reuters poll showing that all 52 analysts that were surveyed believe that is inevitable. On Friday, Ben Bernanke eliminated any remaining doubts, when he declared that, “There would appear — all else being equal — to be a case for further action.” At this point, it is only a question of scope, with markets estimates ranging from $500 Billion to $2 Trillion. That would bring the total Quantitative Easing to perhaps $3 Trillion, exceeding China’s $2.65 Trillion foreign exchange reserves, and earning the distinction of being the largest, sustained currency intervention in the world. The Fed is faced with the quandary that its initial Quantitative Easing Program did not significantly stimulate the economy. It brought liquidity to the credit and financial markets – spurring higher asset prices – but this didn’t translate into business and consumer spending. Thus, the Fed is planning to double down on its bet, comforted by low inflation (currently at a 50 year low) and a stable balance sheet. In other words, it feels it has nothing to lose. Unfortunately, it’s hard to find anyone who seriously believes that QE2 will have a positive impact on the economy. Most expect that it will buoy the financial markets (commodities and stocks), but will achieve little if anything else: “The actual problem with the economy is a lack of consumer demand, not the availability of bank loans, mortgage interest rates, or large amounts of cash held by corporations. Providing more liquidity for the financial system through QE2 won’t fix consumer balance sheets or unemployment.” The Fed is hoping that higher expectations for inflation (already reflected in lower bond prices) and low yields will spur consumers and corporations into action. Of course, it is also hopeful that a cheaper Dollar will drive GDP by narrowing the trade imbalance. At the very least, we can almost guarantee that QE2 will continue to push the Dollar down. For comparison’s sake, consider that after the Fed announced its first Quantitative Easing plan, the Dollar fell 14% against the Euro in only a couple months. This time around, it has fallen for five weeks in a row, and the Fed hasn’t even formally unveiled QE2! It has fallen 13% on a trade-weighted basis, 14% against the Euro, to parity against the Australian and Canadian Dollars, and recently touched a 15-year low against the Yen, in spite of Japan’s equally loose monetary policy. There are plenty of investors that think betting on China is as close to a sure thing as there could possibly be. The only problem is that investing directly in China’s economic freight train is complicated, opaque, and sometimes impossible. The Chinese government maintains strict capital controls, prohibits foreigners from directly owning certain types of investment vehicles, and prevents the Chinese Yuan from appreciating too quickly, if at all. For those that want exposure to China without all of the attendant risks, there is a neat alternative: the Australian Dollar (AUD). Those of you that regularly read my posts and/or follow the forex markets closely should be aware of the many correlations that exist between currencies and other financial markets, as well as between currencies. In this case, there would appear to be a strong correlation between Chinese economic growth and the Australian Dollar. If the Chinese Yuan were able to float freely, it might rise and fall in line with the AUD. Since the Yuan is fixed to the US Dollar, however, we must look for a more roundabout connection. HSBC research analysts used Chinese electricity consumption as a proxy for Chinese economic activity (why they didn’t just use GDP is still unclear to me), and discovered that it fluctuated in perfect accordance with the Australian Dollar. Before I get ahead of myself, I want to explain why one would even posit a connection between China and the Aussie in the first place. There are actually a few reasons. First, Australia is economically part of Asia: “Today, 43 per cent of Australia’s total merchandise trade is with north Asia. A further 15 per cent is with Southeast Asia.” Second, Australia’s economy is driven by the extraction and sale of natural resources, of which China is a major buyer and investor: “In 2008-9, China was the biggest investor in the key resource sector with $26.3bn involvements approved, 30 per cent of the total.” Third, Chinese demand has come to dictate the prices of many such resources, causing them to rise continuously. Thus, Australia’s natural resource exports to countries other than China still draw strength (via high commodity prices) from Chinese demand. As one analyst summarized, “China is buying raw materials from Australia in leaps and bounds, and that’s what’s driving that currency’s growth.” Sounds like an Open and Shut case. In fact, this presumed correlation has become so entrenched that any indication that China is trying to cool its own economy almost always prompts a reaction in the Aussie. To be sure, warnings that China’s annual legislative conference (scheduled for October 17) would produce a consensus call for a tightening of economic policy have made some forecasters more conservative. Still, as long as the Chinese economy remains strong, the Australian Dollar should follow. It’s worth pointing out that the correlation between the Aussie and the Chinese economy doesn’t exist in a vacuum. For example, the Australian Dollar has also closely mirrored the S&P 500 over the last decade, which suggests that global economic growth (and higher commodity prices) are as much of a factor in the Aussie’s appreciation as is Chinese economic activity. The Aussie is also vulnerable to a decline in risk appetite, like the kind that took place during the financial crisis and flared up again as a result of the EU Sovereign debt crisis. During such periods, Chinese demand for commodities becomes irrelevant. On the other hand, part of the reason the Australian Dollar has surged 10% since September and 20% since June is because other countries’ Central Banks (such as China) have increased their interventions on behalf of their respective currencies. Australia is one of a handful of countries whose Central Bank not only hasn’t actively tried to depress its currency, but whose monetary policy (via interest rate hikes) actually invites further appreciation. As the Aussie closes in on parity and Australian exporters and tourism operators become more vocal about the impact on business, however, the Reserve Bank of Australia (RBA) might be forced to act. According to Goldman Sachs (which if nothing else, is good at characterizing financial trends. Remember “BRIC?”), there is a “Wall of Money” that is already flooding emerging markets and will continue to do so for the foreseeable future. “The Institute of International Finance projected 2010 capital flows of $825 billion, up from $581 billion in 2009 and from the $709 billion that the trade group for global financial-services firms had projected for 2010 in April.” In hindsight, the outflow of capital from emerging markets that took place during the financial crisis will probably look like a blip, as risk appetite has already recovered to pre-crisis levels, and then some! “The move into emerging markets has been led by stock investors, who will pour an estimated $186 billion into these countries this year, — fully three times the annual average of $62 billion generated between 2005 and 2009.” Emerging Market Bond funds, meanwhile, now routinely receive more than $1 Billion per week. Sovereign wealth funds are also starting to shift some of their assets into emerging market assets/currencies as part of their respective diversification strategies. As you can see from the chart below (courtesy of The Economist), Asia is by far the largest recipient of investment, followed by Latin America. While it’s understandable, then, that investors would want to rectify this imbalance as quickly as possible, they need to realize that developing countries’ capital markets simply aren’t deep enough to absorb all of the incoming capital. In other words, an limited pool of capital is chasing a limited stock of accessible investments, and the result is that asset prices and exchange rates are climbing inexorably higher. Analysts argue, “Some appreciation is due: a rise against rich-world currencies is both a natural consequence of the faster growth of emerging economies and a way to correct global imbalances.” But a 50% rise over five years (notched by a handful of currencies) does not represent some appreciation, but rather an explosion. This is precisely the sentiment echoed by many of the emerging markets, themselves, which have taken to using guerilla tactics to hold down their currencies. Since the latest phase of the “currency war” was ignited by Japan in September, every week has led to increasingly far-flung countries – Peru, Chile, Czech Republic, Poland, South Africa – reputedly contemplating intervention. According to an interesting economic analysis, which scaled intervention to the size of the given country’s monetary base, South Korea and Taiwan have been among the most active participants in forex markets, while Thailand and Malaysia have been among the most restrained. This is born out by the sizable appreciation of both the Thai Baht and Malaysian Ringit over the last few years. However, I wonder if some economists will take issue with their assessment that Brazil and China have been relatively modest interveners. Of course, this doesn’t make it any easier to forecast, since how a country behaved in the past isn’t necessarily indicative of how it will behave in the future. For example, Thailand just announced that it will not intervene, but Brazil will double its forex tax from 2% to 4%. Case in Point! Almost one month has passed since the Bank of Japan (BOJ) intervened in forex markets on behalf of the Japanese Yen. In one trading session, it spent a record 2.1249 trillion yen ($25.37 billion) to obtain a 3.5% jump in the Yen. Since then, the Yen has continued to appreciate, and now it seems like it’s only a matter of time before the BOJ intervenes again…and again and again. Prior to intervening, Japan’s main concern was that there would be a bitter backlash from the rest of the world. On the one hand, Japan’s fears were validated by accusations that it was engaging in “currency war.” It also received a mild rebuke from US policymakers, who fretted that its intervention would cause China to reconsider allowing the Yuan to appreciate. Others were more forgiving, however, going so far as to excuse Japan’s actions as a necessary response to Korean and Chinese intervention. After all, given that Japan competes directly with these two countries for export market share, how could it sit by idly as they actively devalued their currencies. US Treasury Secretary Timothy Geithner let Japan completely off the hook by telling reporters that he didn’t think Japan “set the fire”for the current dynamic in forex markets. Deutsche Bank(which created the chart below) added, “It must be frustrating for Japanese policymakers to see other Asian economics getting away with such persistent intervention to weaken their currencies. Perhaps the final straw was the Chinese purchases of JGBs [Japanese government Bonds] which some Japanese officials argue played a prominent role in the recent JPY appreciation.” In other words, not only was China holding down its currency against the Dollar, but now it had started to target the CNY/JPY exchange rate. At next week’s G7 meeting, Japan will try to achieve a formal permission slip for its program, by arguing that, ” ‘Our intervention isn’t the kind of large-scale operations that aim to achieve certain rate levels over the long term.’ September’s intervention was only ‘aimed at curbing excess fluctuations’ in the yen’s rates.” Depending on how the G7 responds (via its official statement), it may influence the likelihood of further intervention. Really, then, the only question is when the BOJ will intervene. The Japanese Yen has already fallen below 82 USD/JPY, disappointing analysts that predicted the point of intervention would take place at 83/84, near the point of last month’s intervention. That it has allowed the Yen to continue to slide is somewhat baffling in that it exposes the futility of its previous efforts. The BOJ claims that it isn’t embarking on a program on continuous intervention, but this is really the only chance it has of being successful for any length of time. The Swiss National Bank (SNB) established a “line in the sand” of 1.50 EUR/SWF and spent $200 Billion defending it. Where is the the BOJ “line in the sand?” 82? 80? In theory, this should mean that the Japanese Yen appreciation will soon come to an end. Given the fact that every other major currency (with the exception of the Euro) is being either indirectly or competitively devalued, however, this is far from certain. If Japan is serious about holding down the Yen, it may have to formally declare war. Those who read the most recent Bank of International Settlements (BIS) Triennial Central Bank Survey of Foreign Exchange and Derivatives Market Activity know that daily forex turnover rose 20% over the last three years, to $4 Trillion. According to the official data, the vast majority of participants are financial institutions and the like, which would give the impression that overwhelming majority of trading is engaged in for speculative purposes. Anecdotal research, however, suggests that behind the scenes, it is “passive” foreign exchange trading that is making its presence known. “According to Deutsche Bank, ‘passive’ players – such as corporate treasurers who are looking to hedge currency risk or to facilitate their core business, not to make a profit – account for more than 50 per cent of currency flows.” By definition, these passive players are not out to make a profit, and exchange currencies only because it is necessary to simply conduct business. This is not surprising since the number of confirmed exporters in the US rose 10% during the last year for which data is available. It is almost a given that the number of exporters in emerging markets is increasing an an even faster clip. As a result, corporate banking departments are fighting to keep up with demand for currency exchange/hedging by such businesses, which simply want the ability to know their own profit margins in advance, and can set prices accordingly. Big corporations are among the most reliable hedgers: “Companies lifted the amount of estimated 12-month forward earnings hedged to 34.3 percent on average in September…boosted by a 22 percentage point rise in the U.S. corporations’ hedge ratio to 55.7 percent, the highest on record.” Even Sovereign Wealth funds are reportedly interested in hedging their forex reserves. If not for the enormous pool of passive participation in forex, it might be difficult for speculators to turn a profit. ” ‘The flows from passive players have only limited direct sensitivity to broader market and macro factors, so they can serve as counterparts to investment theme-driven flows,’ ” reports the Financial Times. Since these participants are disinterested in actual forex fluctuations – so long as they can lock in exchange rates using spot and futures transactions – it creates passive momentum for currency movement, and hence opportunities for speculators (including retail forex traders) to turn a profit. In some ways, this is a free lunch to speculators. On the one hand, double-digit currency moves have become so common over the last few years as to become almost mundane, with some currencies routinely rising or falling by more than 5% a month. On the other hand, forex volatility has fallen over time (except during the financial crisis) and is lower compared to other asset classes. For example, “Annualised average daily volatility of the euro/dollar pair over the past decade, for example, is 140 per cent lower than the volatility in the EuroStoxx 50 over the same period.” In addition, “JPMorgan’s index of implied volatility on options for Group of Seven currencies dropped 13 percent in the third quarter, after jumping 22 percent in the prior three months.” This is amazing, since it implies that as uncertainty has risen, risk (aka volatility) has fallen. Interest in forex is also rising among indirect investors, such as pension funds, mutual funds, and retail investors that seek exposure to currency through investment products. “In July, RBC Capital Markets published a survey of 102 asset managers…which revealed that 38 per cent say currency tops the list of asset classes they are most likely to move into over the next 12 months, ahead of equities and commodities.” On a related note, most investment advisers recommend that currencies should comprise 2-7% of every investment portfolio, regardless of objective and tolerance to risk. The number of forex investment “specialists” and related investment products appear to be rising to meet demand variously based on carry, momentum and value strategies. At this rate, it looks like forex volume will set a fresh record in 2013, when the next round of data is released. The Bank of Korea is one of the major participants in the ongoing global currency war, intervening on behalf of the Won to the tune of $1 Billion per day! Meanwhile, the Korean Won has risen 5% in the last month, and 10% over the last three months, the highest in Asia. What a disconnect! While the Korean stock market has surged (13% this ear and 50% last year), it still remains 25% below its 2007 peak and is trading at valuations well below other Asian countries. It’s no wonder that foreign investors have been net buyers of Korean stocks: “Foreigners have bought more Korean shares than they sold every day for four weeks and net purchases for the year amount to some $13 billion.” It doesn’t hurt investors that the currency is appreciating and that interest rates are rising; at the moment, there really isn’t much downside from investing in Korea. Meanwhile, the US (Federal Reserve Bank) is contemplating an expansion of its quantitative easing program, and other Central Banks may follow suit. Under the (now fading) paradigm of risk aversion, concerns of economic decline in the industrialized world would have been accompanied by a sell-off in emerging markets and capital flight to safe havens. As evidenced by the spike in the Korean Won and other emerging market currencies, such is no longer the case. Enter the Bank of Korea (BOK). It is widely known that the South Korean economy is highly dependent on exports, which could be negatively impacted by a rising currency: “For every one percent gain of the won against the U.S. dollar, the nation’s export and gross domestic product decreases by 0.05 percent and 0.07 percent each.” Moreover, South Korea competes directly with Japan, which means the KRW-JPY exchange rate is of crucial importance to the Bank of Korea. Of course, both currencies had been appreciating at a similar clip. Once the Bank of Japan intervened, however, the BOK had no choice bu to double-down on its own efforts. The Bank of Korea seems to appreciate that there is only so much it can do. 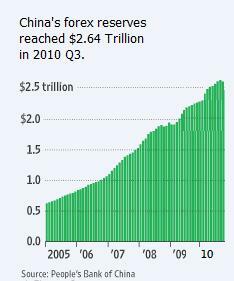 Intervention is not cheap, and its foreign exchange reserves have since surged to $290 Billion. It is also not very effective, and the Korean Won has continued to rise. Finally, the currency intervention contradicts the BOK’s efforts to contain rising prices. By not raising interest rates and trying to hold its currency down, it risks stoking inflation. What’s more – South Korea is actually hosting this week’s G20 summit, at which currency intervention is expected to be a major topic of discussion. It would be awkward, to say the least, if Korea’s own currency intervention was broached. Thus, it seems the Korean Won is destined to keep rising. 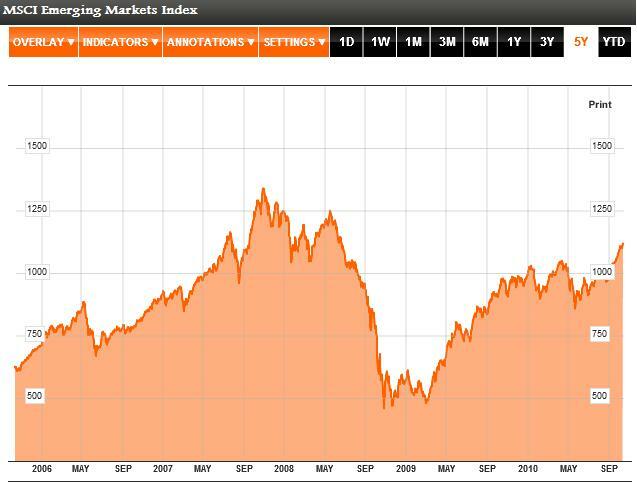 It, too, is well below its 2007 peak, and there is scope for further appreciation. The BOK will continue to make token attempts at halting its rise, but at this point, the forces that is fighting against – bullish investors and other Central Banks – are too great. Currency War: Who are the Winners and Losers? On September 27, Brazilian Finance Minister, Guido Montega, used the term “currency war” to describe the series of recent Central Bank interventions in forex markets. While he may not have intended it, the term stuck, and financial journalists everywhere have run wild with it. In the current cycle (dating back a couple years), more than a dozen Central Banks have entered the forex markets with the intention of holding down their respective currencies, both against each other and also against the US Dollar. What makes it a war is that the Central Banks are fighting to outspend and outdo each other. It is a War of Attrition, in that Central Banks will fight until they’ve exhausted all of their wherewithal, conceding defeat for their currencies. On the other hand, unlike in a conventional war, there aren’t any alliances, nor is there much in the way of little strategy. Central Banks simply buy large blocks of counter currencies and hope their own currencies will then depreciate on the spot market. In addition, since the counter currencies are almost always Dollars and/or Euros, the participants in this war are not even competing directly against each other, but rather against an enemy that isn’t doing much to fight back. [Chart belowcourtesy of Der Spiegel]. The Swiss National Bank (SNB) was the first to intervene, and staged a one-year campaign over the course of 2009 to hold the Swiss Franc at 1.50 against the Euro. Ultimately, it failed when the sovereign debt crisis caused an exodus of Euro selling. The Bank of Brazil was next, although its interventions havebeen more modest; it seems to have accepted the ultimate futility of its efforts, and will seek to slow the Real’s appreciation rather than halt it. Last month, the Bank of Japan spent $20 Billion in one session in order to show the markets how serious it is about fighting the Yen’s rise. In fact, it was this intervention that sparked Montega’s comments about currency war. (The BOJ hasn’t intervened since). All along, the People’s Bank of China has continued to add to its war chest of reserves – currently $2.5 Trillion – as part of the ongoing Yuan-Dollar peg. And of course, there have been a handful of smaller interventions (South Korea, Singapore, Taiwan) and no shortage of rhetorical (Canada, South Africa) interventions, as well as indirect (US, UK) intervention. That’s right- don’t forget that the Fed and the Bank of England, through their respective quantitative easing programs, have injected Trillions into the financial markets and caused their currencies to weaken. In a sense, all of the subsequent interventions have been effected in order to restore the equilibrium in the currency markets that was lost when these two Central Banks deflated there currencies through wholesale money printing. Since much of this cash has found its way into emerging markets (See chart below), you can’t blame their Central Banks from trying to soften some of the upward pressure on their currencies. It’s still too early too early to say how far the currency war will go. The G7/G20 has announced that it will address the issue at its next summit, though it probably won’t lead to much in the way of action. Ultimately, politicians can’t do much more than shake their fingers at countries that try to hold down their currencies. In the case of the Yuan-Dollar peg, American politicians have tried to take this one step further by threatening to slap China with punitive trade sanctions, but this probably won’t come to pass and may disappear as an issue altogether after the November elections. As I reported on Friday, Brazil has taken matters into its own hands by taxing all foreign capital inflows, but this hasn’t had much effect on the Real. That brings me to my final point, which is that all currency intervention is futile in the long term, because most Central Banks have limited capacity to intervene. If they print too much money to hold down their currencies, they risk stoking inflation. Of course China is the exception to this rule, but this is less because of the size of its war chest and more because of the mechanics of its exchange rate regime. For Central Banks to successfully manipulate their currencies on the spot market, they must fight against the Trillions of Dollars in daily forex turnover. Eventually, every Central Bank must reckon with this truism. In terms of identifying the winners and losers of the currency war (as I promised to do in the title of this post, the Euro will probably lose (read: appreciate) because the ECB is not willing to participate. The same goes for the Swiss Franc, since the SNB has basically forsaken currency intervention for the time being. The Bank of Japan has deep pockets, and if the markets push the Yen back up above 85 Yen/Dollar, I wouldn’t be surprised to see it intervene again. With the Fed mulling an expansion of its quantitative easing program, meanwhile, the Dollar will probably continue to sink. And as for the countries that are doing the actual intervening, they might succeed in temporarily holding down the valuer of their respective currencies. 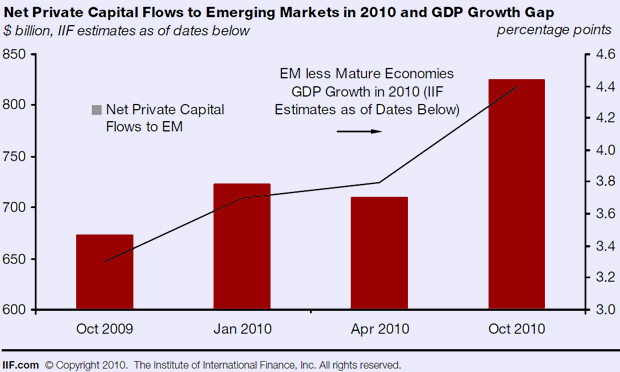 As capital shifts to emerging markets over the long-term, however, their currencies will soon resume rising.